The latest version of the Lauren Greutman budget tracker was released on May 2, 2017. The version number is 70501gr. You can find the version number in the upper right of the Dashboard sheet in your Lauren Greutman spreadsheet. Tiller makes it easy to create up to five sheets that receive daily updates. 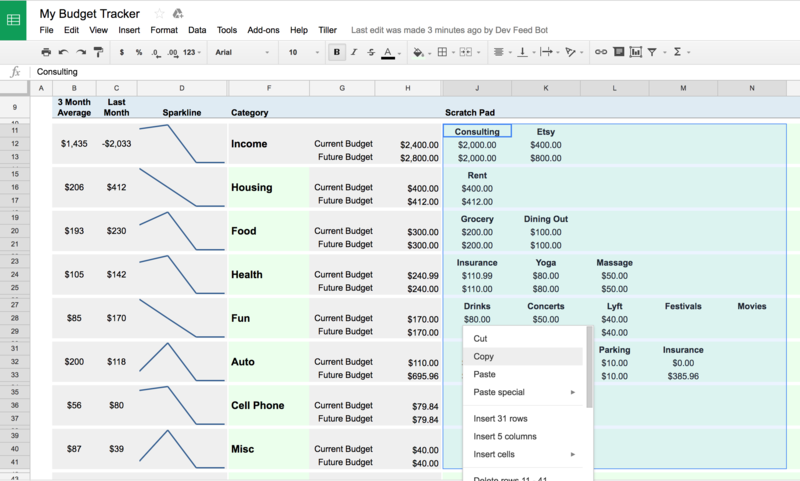 If you want to play with this new template and start from scratch, simply create a new sheet using the Budget Tracker template at sheets.tillerhq.com. If you have been using an earlier version of the Lauren Greutman template and you have lots of categorized transactions you want to preserve, follow these steps. 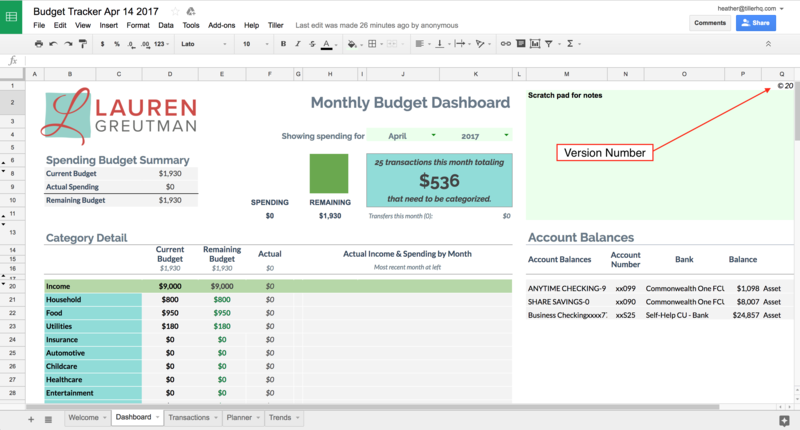 Create a new Tiller spreadsheet using the Budget Tracker template from your Tiller Dashboard. Make the name unique so you can differentiate it from the original one. Make sure you link the same accounts to this new sheet that you did for the original so your transaction data matches up. We recommend manually entering your transaction names in the same order they appear in your original sheet. Copying category names can result in some formatting issues. With your category names in place, next we want to copy your category budget amounts. You can do this manually or copy and paste from your old sheet. On your original spreadsheet select your first budget component in the category breakdown on the Planner sheet by clicking cell J11. Hold down the shift key and select the far right bottom budget component cell. Navigate to the Planner sheet in your new Lauren Greutman spreadsheet, select cell J11, then paste these budget targets. Take a quick look through your categories and budget amounts to make sure they look the way you’d like. Note: Make sure the last couple months of transaction data between the old sheet and the new sheet is identical before performing these steps. This will then confirm that we have the same accounts linked to both sheets. If the past couple months' data are not identical, visit sheets.tillerhq.com to make sure that your new spreadsheet has the correct accounts linked. Navigate to the Transactions sheet in the new spreadsheet, click the row number to select row 2. Do not select the header row. Scroll down to the last transaction in the list, hold down the shift key and then click the last row number. Right click the row number and choose to delete the transaction rows. 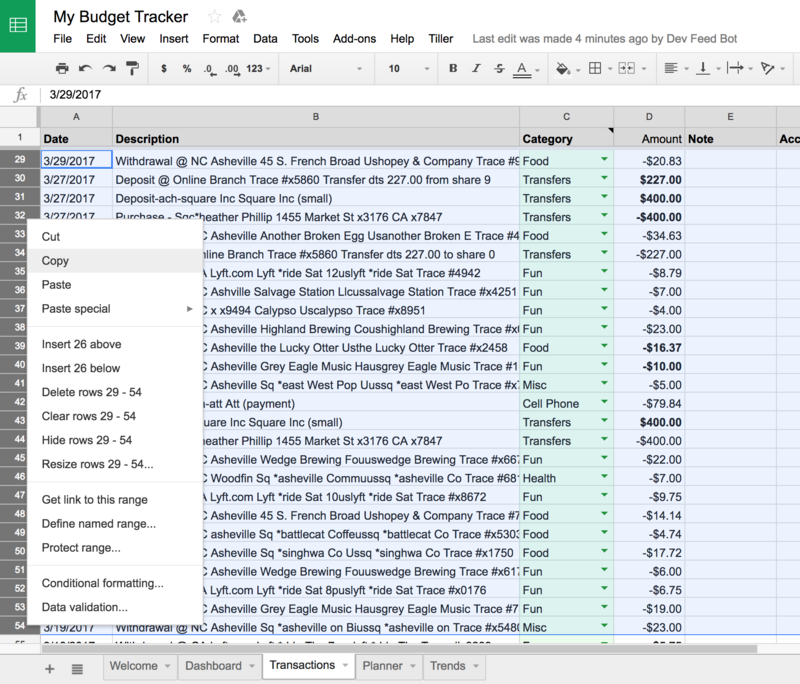 Navigate to the Transactions sheet in your original Tiller spreadsheet. Click the row number to select the first transaction in the list, starting with row 2 if that’s the first transaction you want to copy over. Scroll down to the last transaction you’d like to copy over into the new sheet, hold down the shift key, then click the last row number. Right click the row number and choose copy. Navigate back to the Transactions sheet in the new spreadsheet and right click row 2, then choose Paste Special > Paste Values Only. Be sure to copy over any notes that you might have on the Dashboard, Planner or Trends sheets that you want to migrate to the new version. Now you’re ready to pick up where you left off with the last version of the template. If you don’t need or want to see the previous version of this sheet in your Tiller Dashboard you can unlink the old Greutman sheet.